Well, it's pretty much hats off for the coming summer. … But not for babies! 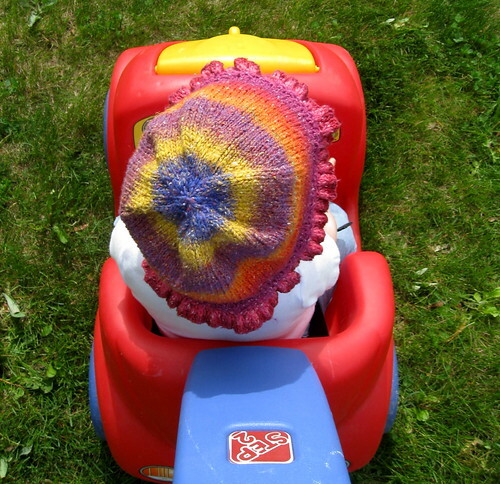 Needle-knit sun hat by my friend, Donna, for lil miss CB. Sorry girly, you still gotta wear a hat to protect your barely-hairy head. 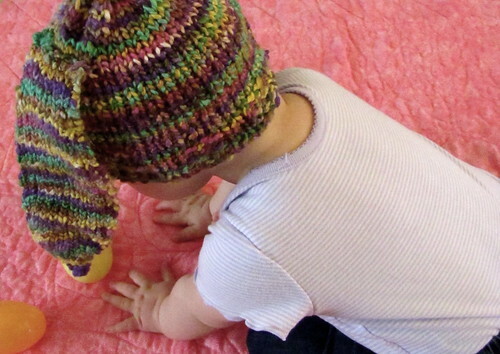 Baby hats are quick and little projects for that summer knitting. 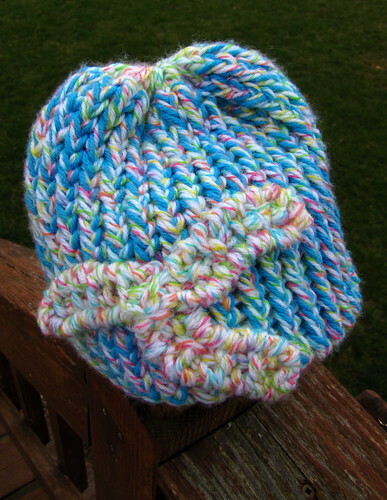 So let's share loom-knit head toppers! First two were for newly borns in March. Crochet cast on 31 pegs. Brim: With Color A, K2 P2 stitches for 8 rows (about 1 inch). Stockinette stripe: With Color B, K all stitches for 8 rows. Seed stripe: Change to Color C.
Repeat 2 rows three more times for 8 rows total. Stockinette stripe: With Color A, K all stitches for 8 rows. Seed stripe: Change to Color B and repeat seed-stitch pattern for 8 rows. Stockinette stripe: With Color C, K all stitches for 8 rows. 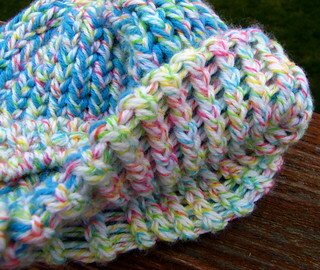 Rib stripe: With Color A, K2 P2 stitches for 8 rows or until the hat measures about 7 inches in depth. Do a gathered bind-off. Add a pompon. Crochet cast-on 31 pegs in Main Color. Brim: K2 P2 for about 1 inch. Knit all for 2 rows. 1. I added a white stitch at Row 15, Stitch 10. This helped me carry the white yarn through. You might want to do the same in the skull area of Row 13 but I did not and just made sure to tighten and knot the main color yarn across that colorwork once I was done. 2. I repeat Stitch 10 on Peg 31. After finishing the skull section, K all rows until hat measures about 7 inches. Go a little shorter for newborns. Add a pompon if you want. 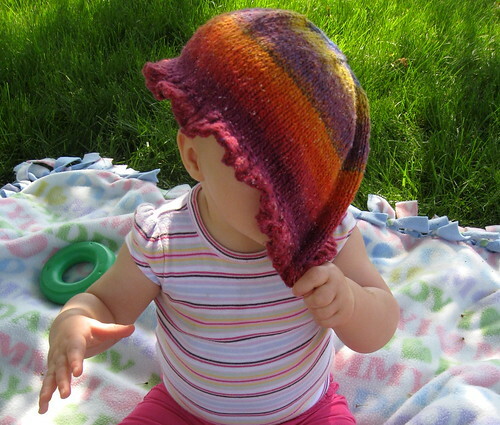 I did not knit this hat. 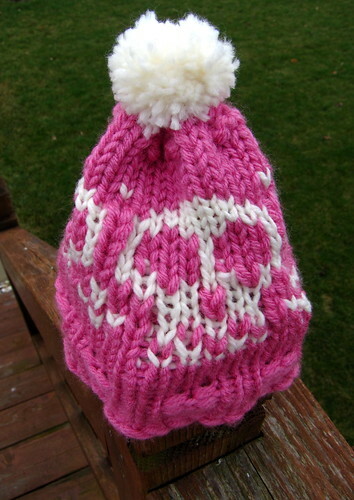 My creative sister, Tracy, loom-knit it herself and has given me permission to share her secrets. 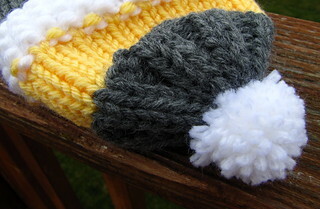 She used the e-wrap knit and double-layered the hat. It probably was loose enough to last a 6-month-old CB another winter but the length would be a little short. So if you like the idea, knit just a bit longer! E-wrap cast on 31 pegs with 2 strands. E-wrap knit for almost 7 inches. Drop 1 strand of yarn. Knit 7 more inches to double the length. 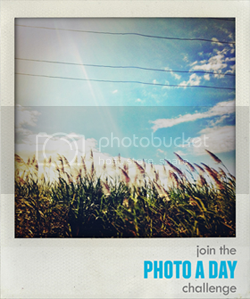 Bring the loops of the first row back up to their corresponding pegs. Knit over. Gathered bind off. 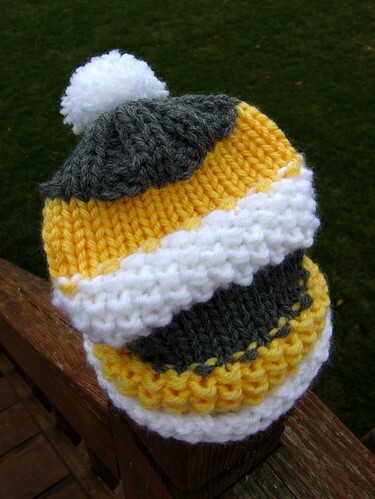 The hat is now double-layered! Flower: My sister winged it with the flower. Here is what she has to say: "For the flower I think I just knit 3 small sections and fashioned them into petals with stitching. I kind of free-formed it so I don't remember exactly what I did now." She cast on 4 stitches and purled the outside stitches for each row (P K K P) for about 3 inches each. Let's hop along to Easter, when I turned CB into a quick-knit bunny. 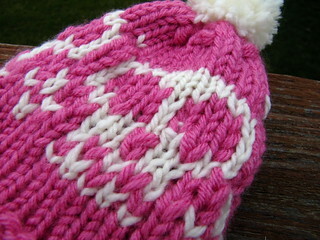 This is an alternate version to my Bunny Baby Hat pattern. Simpler hat, almost double the work for the ears. Knit about 6 inches in stockinette. You will be making 4 ear parts. Two outer and two slightly smaller inner ears. 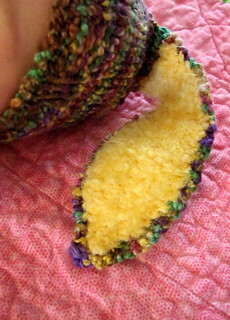 Inner ear numbers are in () and use the furry bulky yarn. E-wrap cast on 8 (6) inches. Knit all for 20 (18) rows, increasing both sides every 10 (9) rows. Knit 20 (18) rows. Decrease both sides on Row 20 (18). Decrease both sides every 3 rows until just 1 stitch remains. Bind off. Sew the smaller ears onto the large ears with yarn of your choice. Wow, typing up these patterns from months past was far beyond a hat trick. I hope they inspire you like the dino hats inspired a group of knitters (Knitting Rays of Hope) who donate to cancer centers. Now it's time to hit the road ... to bed.